While you're here, we invite you to stay in the Stó:lō region from the rocky Fraser River canyon, through the lush valley, picturesque mountain ranges to the mouth of the Fraser River. Fresh crystal clear lakes, mighty rivers, serene hiking trails, majestic views and fresh air await you. Come make family memories over a campout or just relax in one of the many hotels in the area. Sweltzer Creek Campground is only minutes away from Cultus Lake, yet miles away from the crowds. Come and enjoy our spacious campsites in a family atmosphere. 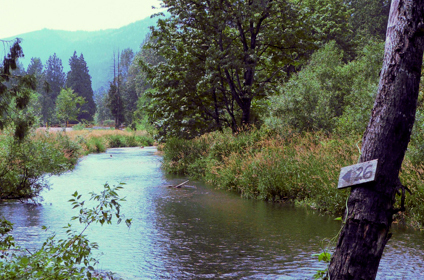 The campsite is nestled between its namesake, the Sweltzer Creek and the Chilliwack River. This beautiful and natural hideaway that is sheltered by large, old Cedar Trees. The Sweltzer Creek flows through the campground, providing creekside camping sites. Sweltzer Creek Campground first began operations in the summers of 1987, 1988 and 1989 as a weekend facility, but now operates everyday throughout May and September in the summer season. It was constructed by the Soowahlie Indian Band on their reserve, and is proudly owned and operated by the Band and its members. The Telte Yet Campground has breathtaking scenery. You will enjoy the beautiful cedar and maple trees, it`s park like setting alongside the mighty Fraser River and views of the majestic Fraser Valley mountains. The campground itself was historically home of the local Stó:lō First Nation people. There are riverfront sites and double sites available. Your campground experience includes fire pits, flush toilets, showers, free sani-station, an ice station, laundry facilities, payphone, and, a covered BBQ area. There are pull through’s available. We have 24 hour security, fully fenced with a main gated entrance. Pets are welcome. Locally made native crafts can be found at the Telte-Yet Campground Gift Shop in Hope at the Hope River General Store, between Hope and Yale. Directions On the Trans-Canada Highway #1 and on the Fraser River in Hope. Welcome to Sts'ailes, your new home away from home! Sasquatch Crossing Eco Lodge features comfortable accommodations with warm and inviting hosts ready to share their extensive local and historical knowledge. Our Bed and Breakfast has bright, comfortable rooms and is located on peaceful grounds with lots to offer our guests. Take a virtual tour of our lodge! This historic property has much to offer, including a rich history and wonderful amenities. Check out what past guests have to say about there stay! Come experience amazing hospitality and delicious food served by the most gracious hosts you will ever meet. Whether you are into kayaking, birding, mountain biking, sport fishing, or just looking for a weekend away, our lodge is the perfect home-base for almost any activity you'd be interested in. Learn more about events and things to do in our area and in Sts'ailes Territory. If you are interested in an authentic local First Nations cultural experience, workshop or tour with Sts'ailes, we can take care of all the arrangements for you to relax and enjoy learning about Sts'ailes culture and traditions.Learn more about cultural experiences we offer and watch some videos of First Nations artisans demonstrating how they create their work. Golf, ski, boat, and view a large variety of wildlife nearby: annual return of five species of salmon and thousands of Bald Eagles in winter.